Specialty CME Credits: Included as part of the 4 credits, this CME activity is eligible for 1 Pharmacology CME credits, subject to your state and institutional approval. Although most cases of acute gastroenteritis require minimal medical intervention, severe dehydration and hypoglycemia may develop in cases of prolonged vomiting and diarrhea. 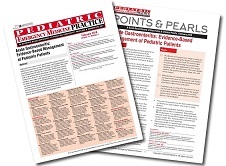 The mainstay of treatment for mild-to-moderately dehydrated patients with acute gastroenteritis should be oral rehydration solution. Antiemetics allow for improved tolerance of oral rehydration solution, and, when used appropriately, can decrease the need for intravenous fluids and hospitalization. 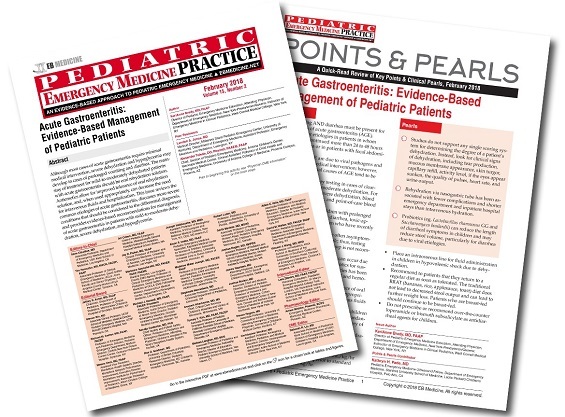 This issue reviews the common etiologies of acute gastroenteritis, discusses more-severe conditions that should be considered in the differential diagnosis, and provides evidence-based recommendations for management of acute gastroenteritis in patients with mild-to-moderate dehydration, severe dehydration, and hypoglycemia. An 18-month-old girl who is up-to-date on her immunizations and has no prior medical history presents with vomiting and diarrhea for the last 3 days. She initially had multiple episodes of nonbloody, nonbilious emesis that stopped yesterday. On the second day, watery, voluminous diarrhea started. Her parents estimate she has had approximately 20 episodes of diarrhea since yesterday; they cannot quantify urine output because she has had so many episodes of diarrhea. The girl does not have a fever or other symptoms. On examination, she is lying on the stretcher with her eyes closed. The girl weighs 12 kg, and her vital signs are: rectal temperature, 37.6°C (99.7°F); heart rate, 165 beats/min; blood pressure, 90/65 mm Hg; respiratory rate, 22 breaths/min; oxygen saturation, 100% on room air. Although she is crying during the examination, the girl produces no tears. Her lips are dry and her eyes appear sunken. Her abdomen is soft, with no tenderness elicited on palpation. Her capillary refill is 2 seconds. She has watery, yellow-colored stool in her diaper. Should you give this child a dose of ondansetron and attempt oral hydration or does she need intravenous hydration? Do you need to send the stool for culture? Do any laboratory studies need to be performed? A great review, and great to brush up on such quality information. So many published studies are so worthless; it's great to have your peer reviewers helping to get quality information to clinicians!